Pinto Gold | Gurney's Seed & Nursery Co. Early. 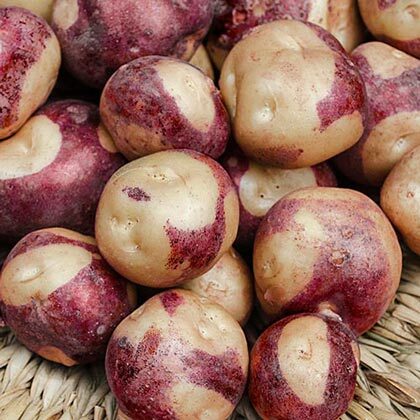 Early to mature and taking the spotlight on the finest gourmet plate, its purplish-red and gold coloring along with a creamy buttery-yellow flesh make Pinto Gold as delicious as it is visually stunning. A top choice for roasting and baking, this fingerling to oval-shaped tuber boasts a superior shelf life making you a brilliant chef for months on end! Spacing12-15 inches apart in rows 30-36 inches apart. FruitRed skin with splashy yellow eyes, smooth buttery yellow flesh. Shape ranges from oval to fingerling. Soil RequirementsPrefers well-drained, light, deep, loose soil, high in organic matter. Performs best in acid soil with pH 4.8 - 5.5. Needs consistent moisture during the growing season. Seed Count1 lb per offer. Can be cut into 8 - 10 sets, planting 8 - 10 ft of row. 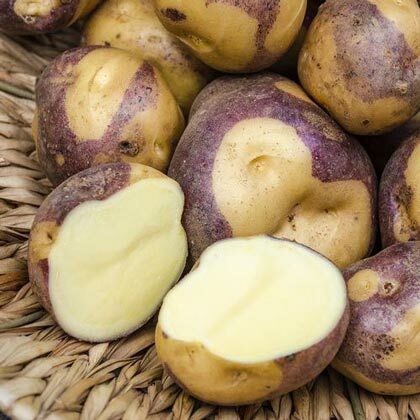 CommentsEarly to mature and taking the spotlight on the finest gourmet plate, its purplish-red and gold coloring along with a creamy buttery-yellow flesh make Pinto Gold as delicious as it is visually stunning. A top choice for roasting and baking, this fingerling to oval-shaped tuber boasts a superior shelf life making you a brilliant chef for months on end!